On 15 June 1215 the Magna Carta was first agreed upon by the King and his rebellious barons. It was reissued in 1216, 1217, 1225 and thereafter on several further occasions, including 1297. The Magna Carta held in Australia is a 1297 copy. The 1297 version is technically ‘a letters patent of inspeximus’ meaning a letter sent in the king’s name for public proclamation, inspecting and confirming earlier legislation. It is basically a reissue of an earlier version of the document without changes. The King at the time, Edward I, having problems with his barons decided to reissue the Magna Carta as a sign of good-will. The Magna Carta is written in standard Latin form, with many words missing or abbreviated and letters missed out or replaced with dashes and signs. It was written this way to save space on the parchment and for the scribe to advertise his skill. The Australian Magna Carta is signed by ‘Iern’, who was Hugh of Yarmouth, the chancery clerk and warrantor of royal writs and charters from 1289. It is most likely the Hugh was not the writer of this Magna Carta, but the official responsible for issuing this document. It was his role to make sure that the text was properly and accurately copied. On the bottom of the Australian Magna Carta is the address where the charter was originally sent. The words found here are Com(iatus) Surr’ exam(inatur) meaning this copy of the Magna Carta was sent to Surrey and Hugh of Yarmouth had examined it for accuracy before it was sent. Nicholas Vincent in Australia’s Magna Carta: history and provenance believes that after being examined and checked by Hugh of Yarmouth the Australian Magna Carta was then sent to Robert of Glamorgan, the Sherriff of Surrey and Sussex, along with the companion 1297 Forest Charter also checked and signed ‘Iern’. The Sherriff then passed the two documents into the custody of the nuns of Eastbourne Priory in Sussex for safe-keeping, where they likely remained until the dissolution of the monasteries in the 1530’s. A substantial number of deeds including the 1297 Forest Charter and Magna Carta were then passed into the possession of a family who employed a solicitor by the name of John Louch, based in Drayton, Somerset. The solicitor stored all the documents in his strongroom deedboxes and at some stage prior to 1905 the Magna Carta became separated from the rest of the documents. It is thought that it may have been accidently transferred from the deedboxes in Mr Louch’s office to the King’s School in Somerset, just 20 miles from the solicitors office. After the death of John Louch in 1905, the 1297 Surrey Forest Charter was donated to the British Museum, where it became lost and was not rediscovered in the collection until 2007 (the rest of the story might have been different if the Museum realised that they had the companion to the 1297 Surrey Magna Carta in their collection). 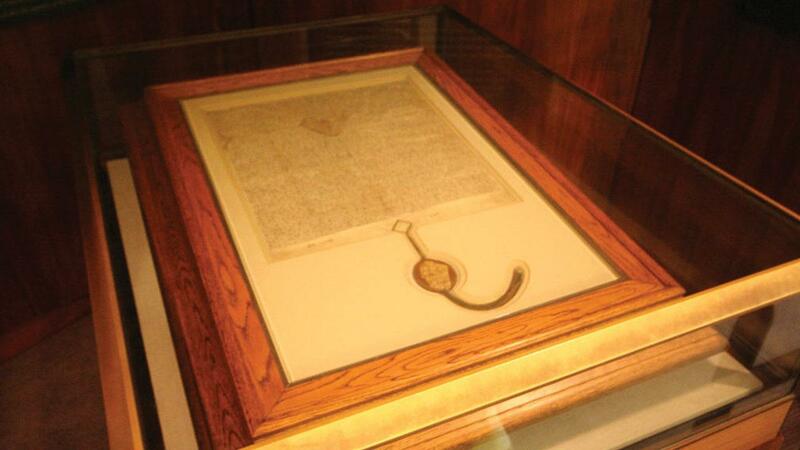 It wasn’t until the late 1930’s that the 1297 Surrey Magna Carta was discovered at the King’s school in Someset. In early 1951 the governor from the small and impoverished school took the document to be examined by experts at the British museum in London. The museum recognised it as a 1297 copy of the Magna Carta and as they didn’t have a copy from this year within their Magna Carta collection they immediately looked at acquiring it. The price that the museum offered was a maximum of £2,500. The headmaster, thinking he might be getting a raw deal, removed the Magna Carta from the Museum and took it to Sotheby’s to be valued. This valuation came in at £12,500 including commission and auction house began looking to sell the document to Australia. The keeper of manuscripts at the British Museum, Arthur Collins, still hoping that the Magna Carta could be acquired by the Museum started to look at other ways to prevent a sale of the document to Australia. He enlisted the help of a committee of experts established to supervise the export of items of historic significance. If he couldn’t purchase the 1297 Magna Carta from the school for his low sum, he was going to try his hardest to prevent it being sold overseas. In the meantime the Library Committee of the Australian Parliament were discussing the possibility of purchasing the Magna Carta and they kicked off a press campaign to gain public support. After many heated meetings the British export committee decided that the King’s School Magna Carta could be exported to Australia as long as another copy of the 1297 Magna Carta could be found for the London Museum. The Corporation of London (City Council of London) held a copy and it was decided that the British Museum could request a loan of it (this never eventuated and the British Museum still does not have a 1297 copy of the Magna Carta). By April 1952, with the school agreeing to sell the Magna Carta to Australia for £12,500 and the export of the document being approved, Australia’s National Librarian Harold White, set about ensuring that it would end up in Australia. The National Librarian knew that he had to act fast. Other historical documents had been selling in the USA for much higher prices and there was a fear that the school may look at selling the Magna Carta to the US instead of Australia. With the National Library having difficulties raising the required funds, the private-treaty sale expired on 30 June 1952. Finally, eight weeks later on 19 August the Australian Prime Minister Robert Menzies announced in Parliament that the £12,500 would be advanced from the Prime Ministers Department rather than the budget of National Library. The Magna Carta was then packed up and sailed from London to Australia, arriving on 28 November 1952. It received conservation work until 1961, before being placed in the King’s Hall in Parliament House. It was moved very briefly to the National Library in the late 60’s, then back to King’s Hall and when the new Parliament house opened in 1988 it was moved to the new location. It has remained in Parliament House on display for all visitors since. You can read a full account of this story in Australia’s Magna Carta which can be ordered from Department of the Senate. Australia’s Magna Carta is one of only 23 or 24 such documents that survive and that can claim status as original Magna Cartas. The two copies held outside of the UK are both 1297 versions. The copy held in the US was bought at auction in 2007 for US$21.3Million.